There is an abnormal vascular network formation at the base of the brain. It is a cause of both ischaemic and to a lesser extent haemorrhagic stroke. It can be inherited or acquired. It may present in childhood. Later characterised as "moyamoya" in 1965. Commonest in Asian (Japanese, Chinese and Koreans) it does occur in other non Asian populations. Familial cases are linked to a gene on Chromosome 17. Cases are both sporadic and familial. Overexpression of angiogenic and endothelial growth factors. Increased levels of Basic fibroblast growth factor has been found in MMD which is one of several areas of further research. SLE, Grave's Disease, APS and various other genetic disorders. Formation of fragile collateralisation arteries which can bleed. Major artery and peripheral artery aneurysms can also be found. Bleeding is seen more so in adults and is the main cause of mortality and morbidity. Bleeding is both from fragile collaterals and rupture of saccular aneurysms on the circle of willis or from dilated perforators [Kuroda S 2008]. Most commonly Children present typically with recurrent episodes of sudden hemiplegia that might alternate sides. Moyamoya disease can affect children and young people with TIA episodes. May also be strokes, chorea and seizures. It causes predominately ischaemic stroke but haemorrhagic stroke is also seen due to bleeding from fine collaterals and is commoner in Adults. CT Imaging can show either cortical or subcortical infarction and even some cortical volume loss. Subcortical lesions seem to occur earlier. CT can also show deep and lobar haemorrhage. MRI/MRA should be performed for the diagnosis. 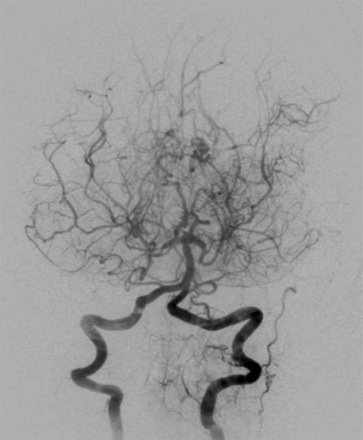 This shows carotid narrowing or occlusion in the distal internal carotid and fragile collateral vessels give traditional "puff of smoke" appearance on cerebral angiography. MRI Gradient echo may show prior or new haemorrhage. The finding of dilated collateral vessels in the basal ganglia and thalamus can be demonstrated as multiple punctate flow voids and is regarded as virtually diagnostic of Moyamoya syndrome. MRI FLAIR images and post contrast T1 images can show a linear pattern of increased signal in the leptomeninges and perivascular spaces. This pattern has been termed the "ivy sign", since it resembles the appearance of ivy creeping on stones. Transcranial Doppler ultrasonography if available is a noninvasive way to evaluate intracranial haemodynamics and large artery stenosis. Management includes medical and surgical options. Patients are referred to centres of excellence with experience in this disease. Medical options are unproven but include vasodilators and some would avoid antiplatelets especially in older patients. General blood pressure management would seem wise. Most would consider surgery in symptomatic patients. There are a variety of procedures to increase blood supply. Surgical treatments are divided into 3 types: direct, indirect, and combined/other methods. Direct bypass includes superficial temporal artery (STA) or sometimes the occipital artery to Middle cerebral artery (MCA) anastomosis or use of other graft types. Indirect procedures bring in circulation to the intracranial regions by introducing newly developed vasculature from newly approximated tissues. Recent evidence tends to favour a direct strategy in reducing haemorrhagic risk. Children are given aspirin but without any real evidence base and it is stopped in adults due to risk of bleeds. Haemorrhagic lesions are the commonest cause of death. Moyamoya Disease and Moyamoya Syndrome. N Engl J Med 2009;360:1226-37. Moyamoya Disease: Treatment and Outcomes. J Stroke. 2016 Jan; 18(1): 21–30. Characteristic EEG findings in childhood moyamoya syndrome.Neurosurg Rev 1992;15(1):57-60. Comparison of MR Perfusion Weighted Imaging and CT Perfusion Imaging in Assessing Hemodynamics of Patients with Moyamoya Disease.Sichuan Da Xue Xue Bao Yi Xue Ban. 2018 Sep;49(5):749-753.